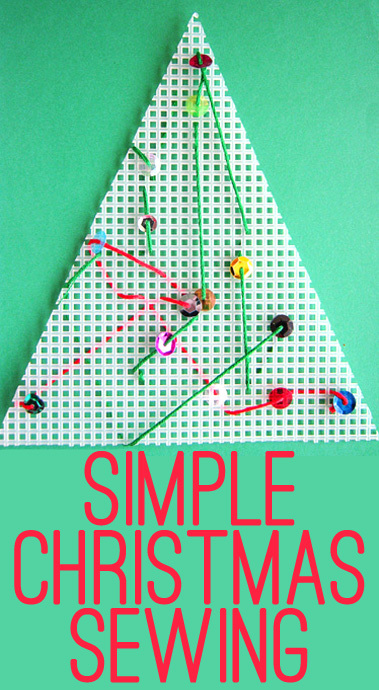 I still had plastic canvas left from our previous simple sewing activity and thought that a piece of it would be perfect for a Christmas tree inspired sewing project. 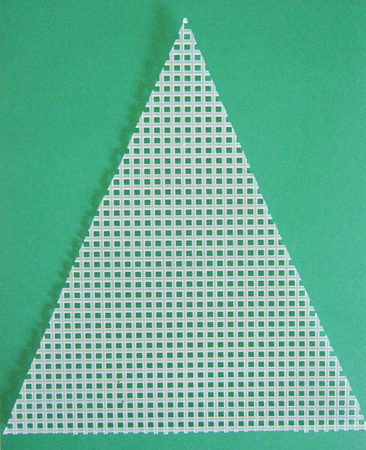 To make: Cut a triangle from the plastic canvas. 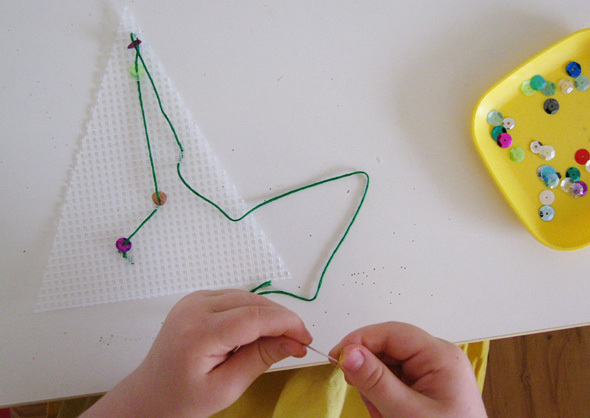 Add a preschooler, relatively blunt needle, embroidery thread and sequins! They can have fun ‘sewing’ on sequins to their hearts content to make a pretty Christmas tree all of their own! I simply reminded Immy to always come up from the back to the same side when adding the sequins (not that it really matters!) and to always pull the thread all the way through. Add a loop of embroidery thread to hang on the tree for a very unique Christmas decoration. and be sure to check out my book and ebook, Time to Create, for even more information about sewing with kids. Ours was from Spotlight, Grace, but I think anywhere that sells cross stitch and embroidery crafting goodness would have it. 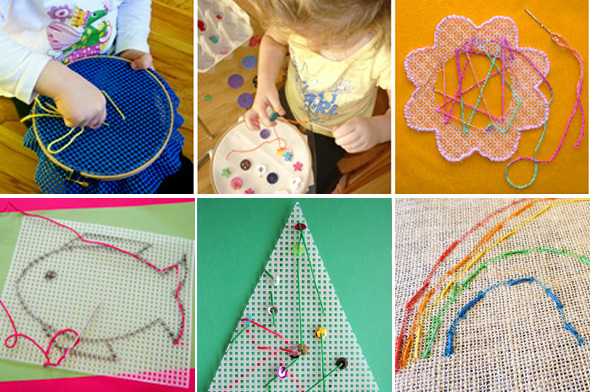 Love doing weaving and sewing activities with the kids. Wonderful fun! This is a great idea! I needed something to do with my niece and nephew today and this looks like the winner. Oh brilliant. My daughter would love this activity. I wonder where to get those matts? I will have to take a gander at our craft store. Was it pretty easy to cut into a triangle? Did you use very sharp scissors and it didn't splinter at the ends? I would think any craft store that stocks embroidery thread and products would be likely to have it, Heather. Thank you for this fabulous idea. My 5-year-old students loved, loved, LOVED this!